Nejc Kuhar finished his Masters degree in guitar at Vienna University of Music and Performing Arts with prof. Alvaro Pierri and his Master’s degree in composition with Dr. Reiner Bishof and prof. Christian Minkowitsch at Konservatorium Wien, Privatuniversität, both with honours. Since 2015 he has been teaching guitar at Music Academy in Vienna and Music University and Music School in Frankfurt. As a guitarist as well as a composer, he has won numerous prizes (1st prizes in Germany, China, Italy, Turkey, USA, etc.) and was also a scholarship holder of the Slovenian Ministry of Culture and the Gallus Foundation. His music has been performed by himself and/or other musicians in prestigious venues, including Musikverein and Konzerthaus in Vienna, Washington National Gallery of Art, Rachmaninov Hall of the Moscow Tchaikovsky Conservatory, Slovene Philharmonic Hall, etc. His commissions include those by the Washington National Gallery of Art, Frankfurt Universität für Musik und darstellende Kunst, LiGITa, Hong Kong and Sarajevo Guitar Festivals, Signum Saxophone Quartet, guitarist Mak Grgić, organist Stephen Ackert, Four Aces Guitar Quartet and others. Kuhar’s works have also been published by renowned publishing houses, such as Les Production d’Oz (Canada), Trekel (Germany) and Berben (Italy), some of which are recorded on his debut CD from ZKP Label, entitled “String modulations”, featuring guitar virtuoso Mak Grgić. Nejc regularly performs solo concerts, teaches master classes, gives lectures, as well as acts as jury member on various international guitar festivals (LiGiTa in Liechtenstein, Forum Wien, Taiwan Guitar Festival, Sarajevo, Seckau, Postojna Guitar Festival in Slovenia). His concerts have a special charm and uniqueness due to his interpretations of his own compositions. Ermin Tkalec started studying the piano as a child in Rogaška Slatina, where he completed the Lower music school under the mentorship of prof. Andrea Seljan Drofenik and continued his studies at High school of Music in Ljubljana with professors Janez Lovše and Helena Megušar. After graduation he enrolled in the Academy of Music in Ljubljana, where he studied under prof. Dubravka Tomšič Srebotnjak and participated in the Erasmus student exchange in Vienna where he was a student of prof. Martin Hughes. He received his Master’s degree in 2016. He has won numerous prizes of highest rank on both national and international competitions. As a soloist he has thus far been accompanied by the Ljubljana High school of Music and Ballet orchestra, Slovene National Opera and Ballet Theatre Ljubljana orchestra and the Slovenian Philharmonic orchestra. Recognizing his successful work, the Academy of Music Ljubljana presented him with a Prešeren award for students. Earlier this year he sucessfully passed his audition to study at the Royal College of Music in London. Born in Ljubljana, Vasja Štukelj studied history and philosophy at University of Ljubljana. He finished his studies in 2006 with a Master’s degree in philosophy. For more than a decade he has been studying Indian classical and folk music under the guidance of his teacher Ustad Faiyaz Khan, respected grand master of tabla and one of the most famous and best exponents of Delhi style in tabla playing. After his passing he has been continuing his studies with his teacher’s grandson Imran Khan. He has also been studying Spanish flamenco cajon and music under the guidance of cajon masters Rafael Casado and Guillermo Garcia – »El Guille« from Madrid. He performs as a soloist on tabla and accompanist, plays Indian classical and folk music, flamenco, early baroque, classical Persian, fusion and contemporary music in Slovenia and abroad. Throughout his career he has shared the stage with internationally renowned artists such as Ustad Faiyaz Khan, Steve Stevens, Ustad Johar Ali Khan, Prassana Ramaswamy and others. Anja Mejač learned her first dance steps already at the age of 7 in Kazina, Slovenia’s first dance school. She spent her childhood taking jazz and tap dance lessons under the guidance of acclaimed teachers and choreographers, most notably Mojca Uršič, Mitja Popovski and Mirjam Podobnik. As a member of the school’s competitive team she won many awards on national, European and World championships in show and tap dance categories. She has been acquiring her knowledge of flamenco at the established dance academy Amor de Dios in Madrid, where she has learned from world famous flamenco dancers such as Merche Esmeralda, Cristobal Reyes, Carmela Greco, Miguel Cañas, Concha Jareño, Antonio Reyes, Esperanza de la Vega and Curro de Candela. Besides flamenco she is also upgrading her dancing skills by taking ballet classes under the mentorship of Nadine Boisouvert, Darmaga Brown Silvia Piñar and Marinka Ribič. 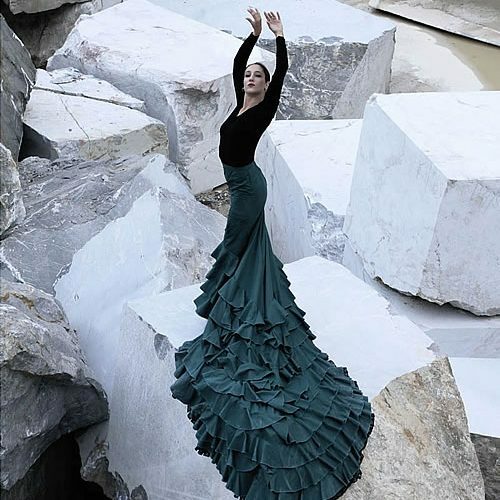 In November 2013 she performed in a dance show titled La Rosa del Penal, which was created in collaboration with Saška Šašić La Sali and premiered at the CIBRA Film Festival (Festival del Cine y La Palabra, La Puebla de Montalban) in Toledo. The show was presented to Slovenian audiences in February 2014 in Ljubljana’s SiTi Teater, made a guest appearance in SKC Kragujevac (Serbia) a month later and participated at the third annual Flamenco Festival Zagreb in July that same year. She is the artistic director of the multidisciplinary project titled Submerged Poetry (Potopljene poezije), which seeks to intermix various fields of artistic expression. As part of that same project she created and performed in the shows Prosto srce (Flamenco Festival Zagreb in June 2015 and Festival noči v Stari Ljubljani in August 2015) and Neiztrohnjeno srce (Slovenian National Gallery in February 2016). In 2015 she graduated from Academy of Fine Arts in Ljubljana and is currently a first year Master’s degree student in the Art of Movement program under professor Tanja Zgonc at Academy of Theatre, Radio, Film and Television in Ljubljana. Voranc Boh is an actor and musician. Since his early childhood, he has been performing with various improvisational, puppet and dramatic theatre groups and has toured with them in the Balkans, Austria, Switzerland, Thailand and Nepal. He received his training in multiple improvisational theatre and circus workshops in Slovenia and abroad, taught by renowned artists such as Shawn Kinnley and Michal Hecht. He appeared in one of the leading roles in the film Class enemy which has won many international prizes, including best film award at the 28th Venice Critics’ Week. 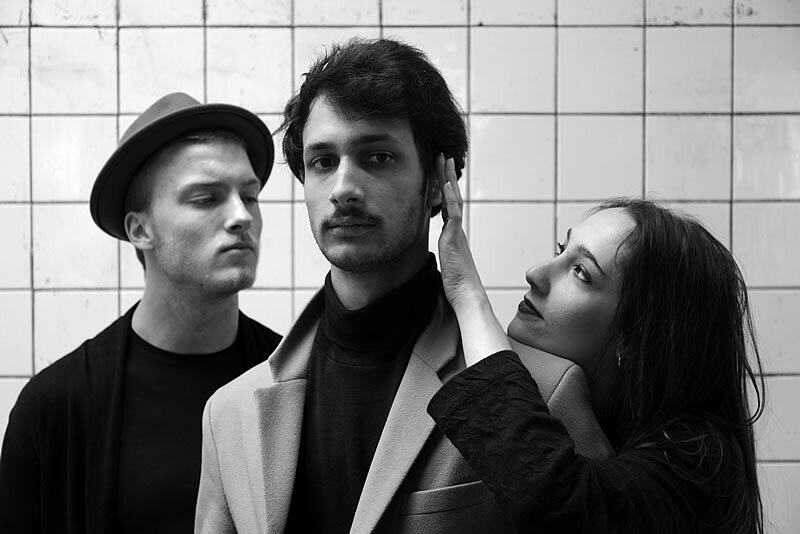 He is also a member of three musical bands and has sung their way into the final of the first Poprock festival held by Slovenian national television with one of them. He is currently finishing his undergraduate studies in stage acting at the Academy of Theatre, Radio, Film and Television in Ljubljana, where he has acted in many successful productions that have toured in Serbia and Germany. Pia Vatovec studied dramaturgy and performing arts at the Academy for Theatre, Radio, Film and Television in Ljubljana. She has worked as dramaturge on several theatre productions and dance performances. Born in 1993, she spent her childhood as a competitive dancer, winning numerous titles on national, European and world championships in show and tap dance with her team. She has thus recently been focusing on exploring the field of dance dramaturgy and has collaborated with the renowned choreographer Mitja Popovski. Besides dramaturgical practice, she has also worked as a screenwriter on two short films, one of which was screened at the Slovenian Film Festival in August 2015 as part of the competitive program, and had one of her theatre plays presented at the 2013 Maribor Theatre Festival. She is also active in the area of arts journalism, currently holding the position of theatre and dance section editor at the web based cultural platform Koridor. Aljoša Vrščaj started playing the guitar at the age of 16. He graduated from the Academy of Music in Ljubljana. He gives concert performances mostly as a chamber musician — in a guitar duo, in a duo with violin and as a member of the Slovenian Guitar Quartet. In addition, he graduated in translation studies. Born in Ljubljana, Luka Ostrež began his early dance education at the age of five, studying jazz dance and later on switching to modern dance and classical ballet. While receiving his training in Kazina dance school with choreographer and teacher Mitja Popovski, he has also been improving his technique by attending workshops in Slovenia and abroad, taught by acclaimed teachers such as Mojca Urši, Marinka Ribi, Kjara Starič Wurst, Miloš Isailovi, Dollie Henry, etc. In 2015 he travelled to South Africa where he performed in the collaborative dance show Slo-Africa, which was presented to the Slovenian audience later that year. As part of the Slovenian national dance team he has won many international prizes and currently holds the title of modern solo and duo vice-world champion. He has also appeared on various television shows as a member of a professional dance group. In September he will begin his Bachelor of Contemporary Dance studies at Zurich University of the Arts. Submerged Poetry is a multidisciplinary project that connects the art of flamenco, poetry, classical music and visual arts.